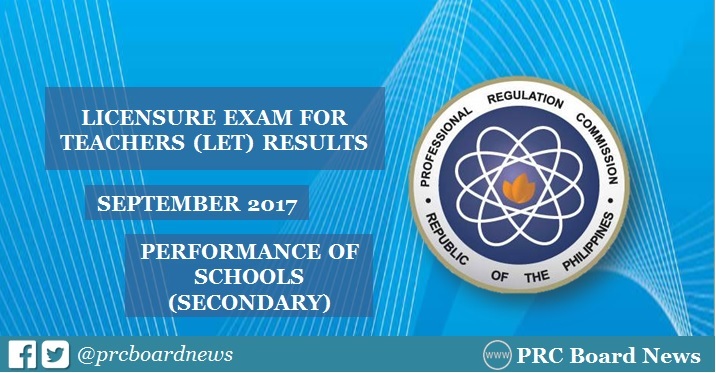 MANILA, Philippines - The Professional Regulation Commission (PRC) released results of September 2017 Licensure Exam for Teachers (LET) also known as Teachers board exam on Monday, November 27, 2017 or in 43 working days after the exam. Those awaiting results can check on this page for the list of top performing schools as well as the performance of schools for Secondary level board exam. University of the Philippines - Los Banos (UPLB) led the schools for Secondary level, 98.33 % or 59 out of 60 passed the exams. University of Santo Tomas (UST) ranked second with 94.74% or 162 out of 171 passed the tests. The second board exam for teachers this year was administered on Sunday, September 24, 2017 in at least 27 testing centers in the country and in Hong Kong and Bangkok (Special Professional Licensure Examination or SPLE). Testing centers include Baguio, Bacolod, Cagayan de Oro (CDO), Catarman (Northern Samar), Cebu, Davao, General Santos, Iloilo, Laoag, Legaspi, Lucena, Manila, Rosales (Pangasinan), Tacloban, Tuguegarao, Pagadian and Zamboanga. PRC designated additional test centers for September 2017 LET per Resolution No. 2017-1047 — Mamburao, Occidental Mindoro; Calapan City, Oriental Mindoro; Odiongan, Romblon; Kidapawan Cotabato, Boac, Marinduque; Virac, Catanduanes; Puerto Princesa City, Palawaan and Masbate City. PRC recognized University of the Philippines - Diliman (UPD) as the top performing school in the September 2016 LET Secondary level, 96.84% or 92 out of 95 passed the exams. De La Salle University (DLSU) - Lipa ranked second with 91.38% or 53 out of 58 passed. In the September 2015 exams, UST led the schools with 94.92% (168 out of 177). Philippine Normal University (PNU) - Manila ranked second with 91.79% or 660 out of 719 passed. According to PRC Resolution No. 2016-1019, which deals with the 'Schedule of Licensure Examinations for Year 2017, the target release date of September 2017 LET board exam results is on Monday, November 27 or in 39 working days after the exam.